Lisa Snider's one-act play, Finding Ojai, based on her novel in progress by the same name, will debut at Santa Paula Theater Center's one-act festival June 1 through June 17, Fridays and Saturdays at 8:00 p.m. and Sundays at 4:00 p.m. with no performance on Saturday, June 9 and a special added performance on Thursday, June 7 at 8:00 p.m.
"Susan is a career-driven young woman working at a world-class resort in a funky new age town. She is torn between her aspirations in the shrewd corporate hospitality business and the eccentric hippie culture she now calls home. A bartender, an unlikely prophet named Joel, guides her on her search for success and status, leading her to a place she's never been: she finds herself." Howard and his two sons are on their annual deer hunt, just as they have done for twenty years. One afternoon just before sunset, an errant shot leaves a father guilt-ridden, one son resentful and another confronting a secret that has been haunting him since returning from the war. 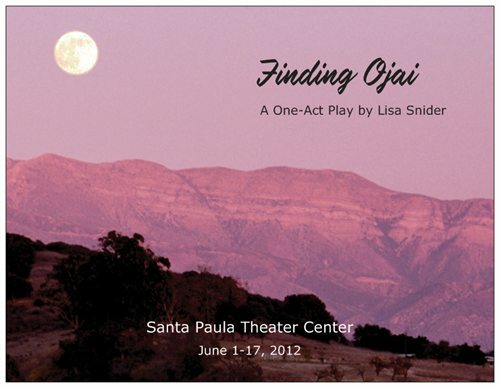 Click here to read the front page article published in the Ojai Valley News on 1/12/11. Click here to read the article published in the VC Reporter on 1/13/11. Click here to read the article posted on Noozhawk on 1/13/11. Click here to see the on-camera interview with Ojai Valley News In Depth, 1/21/11.